We’re a little late here, the last month has been jam-packed. But H and I signed up for the Kids Quilt Round Robin that Sarah Nunes from Berry Barn Designs and Sarah Goer are organizing this summer. 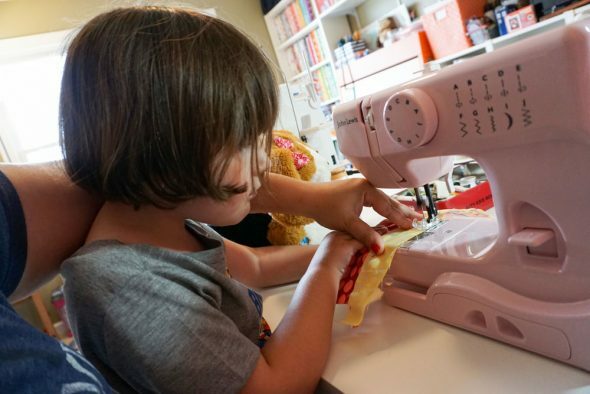 Sarah Nunes reached out to me after I posted some Instagram photos of H and her new sewing machine, and it seemed like such a great chance to get a little sewing in this summer and learn some new techniques with my new sewer. We were supposed to have our first block in the mail by June 1, but we just finished the block today. It is done! And I will get it in the mail tomorrow! And then we will (hopefully) not fall behind again. I will explain more about why we’ve been so busy in another post, but for now let’s talk about our block. For the round robin, we had to design either a 20″ finished square block, or a 10″ x 40″ finished row. H’s favorite color these days is brown (“It’s the color of my hair!”). But I’ve been craving some rainbow sewing, so I sketched out a block that combined bright colors and neutrals she likes. 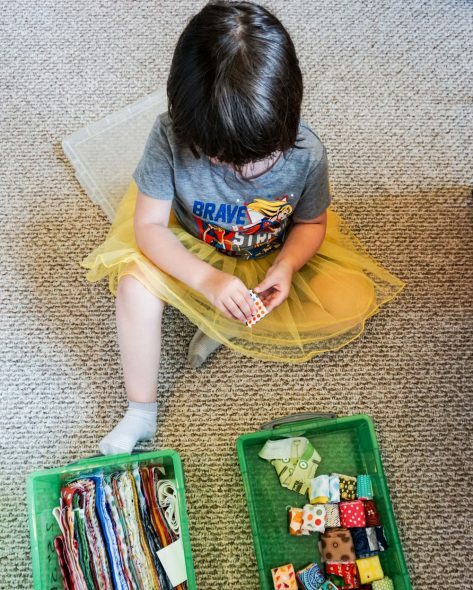 She picked out all of the fabrics from my scrap bin of 1.5″ and 2.5″ strips. 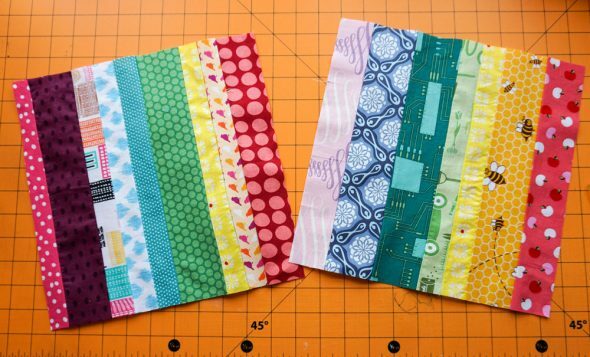 And then we made these rainbow stripe blocks and squared them up to 10-7/8″ squares. Then I also cut 1 brown fabric square that same size, and one gray-ish square the same size so we could make half square triangles. This is an easy method for making them. 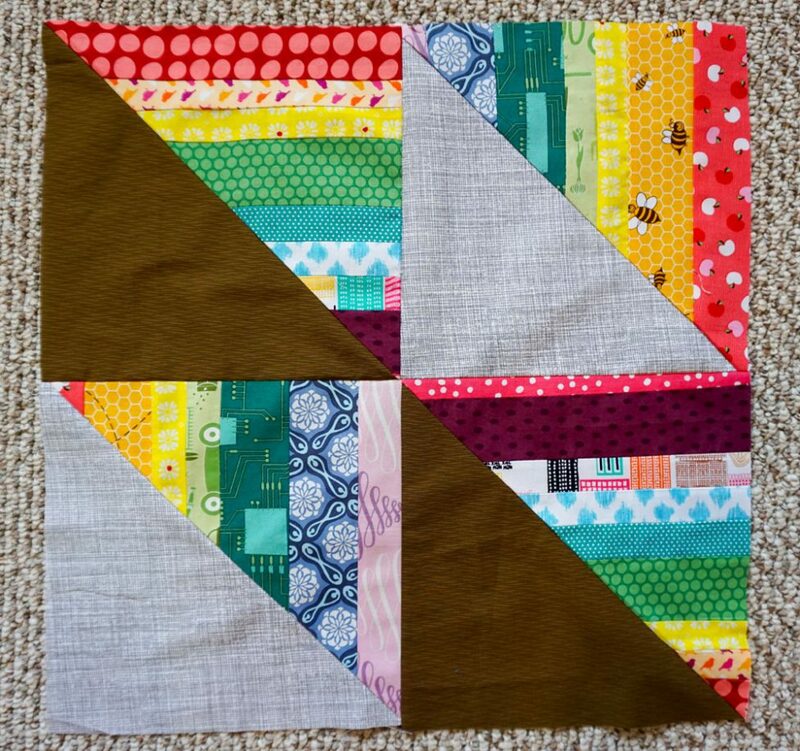 Whatever you want the finished size of the block to be in your quilt, cut 2 contrasting squares to be 7/8″ bigger. 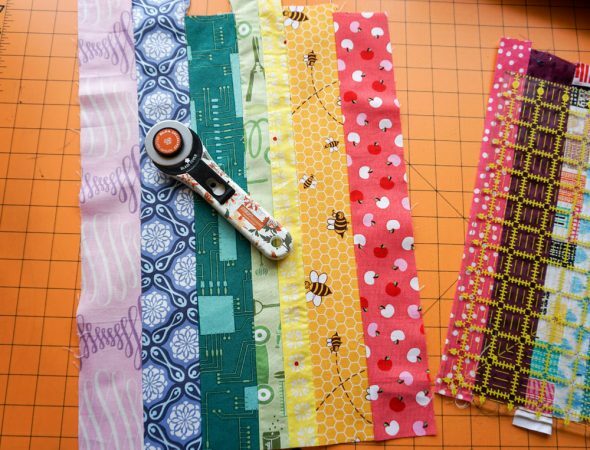 Then mark a diagonal line from corner to corner, sew a 1/4″ seam to the left and to the right of that diagonal line, and cut the sewn squares on that diagonal line. You’ll have 2 half square triangles that should be the right size. So, we made 4 10″ finished half square triangles to make our 20″ x 20″ block, which I think worked out really well. I’m excited for this quilt! And excited to see what we get back at the end of the summer. Now you two have me waiting and antipating the final quilt too!